Since its opening day, Rodizio Grill, owned & operated by Ryan Houdek, has captured the hearts of people of Fort Collins and throughout Northern Colorado with its traditional Brazilian steakhouse style dining. Come and be a part of this authentic dining experience from the southern Brazil region near Sao Paulo, where the food is the entertainment and the service is graced with skill and frivolity. Bom Apetit! With one step into its stunning entry, diners immediately recognize this restaurant is especially unique. You will be dazzled with music and an abundance of food! The atmosphere is lively and uplifting, a perfect place to bring a group of friends and family to enjoy the festive surrounding! Churrasco has its roots from the early 1800’s. Cattle-herding cowboys or “gauchos”, in the vast plains of the southernmost region of Brazil would gather with family & friends after butchering a cow. They would prepare a delicious feast by slow roasting various cuts of meats over an open flame pit. The meat was seasoned simply with coarse salt and slow-cooked in its own juices. Then, small slices were passed around until everyone was full, a tradition that led to “Rodizio”, a dining style of continuous service. Everything at Rodizio Grill is homemade, it’s the Brazilian way! You have the option of choosing The Full Rodizio or Unlimited Salad Bar only. The salad bar offers over thirty gourmet, made from scratch daily items, even the mayonnaise to make the salads is homemade. Unlimited authentic Brazilian appetizers, delicious hot pasta dishes, to whipped potatoes, sautéed collard greens and bacon, Feijoada (Brazilian black bean stew), signature salads, fresh fruits & vegetables, varieties of cheese, soups and more are available. Salad bar items vary according to the season. The full Rodizio is a fabulous selection of unlimited freshly made hot sides, salad bar items and skewered meats. Each table is served warm Pao De Queijo (Brazilian cheese bread) fresh out of the oven and melt in your mouth sweet fried cinnamon – glazed bananas. 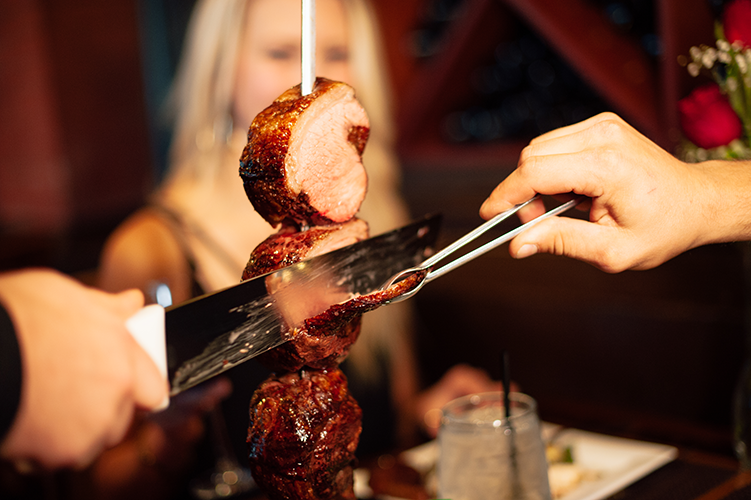 This Brazilian steakhouse (churrascaria) features over a dozen rotisserie grilled meats that are perfectly seasoned and carved tableside by the Brazilian gauchos. The gauchos will rotate sizzling skewers (espetos) of meat to your table slicing them to your desired temperature. You partake in tasting as many of the meats as you wish, and as many times as you wish. You have many different Brazilian meats to satisfy your taste buds including chicken wrapped in bacon, sirloin steak, seasoned top sirloin known as Picanha (tip: always ask for the Picanha), lamb, Portuguese sausages, grilled chicken and grilled and glazed pineapple and more. By displaying a two-sided red/green cue at the end of your table you control the pace of your meal and advise the Gauchos of your current preference: Green signals to the Gauchos that you are ready for new mouth-watering cuts. Red indicates that you are taking a break or are full. Desserts are a sacred part of every meal in Brazil – the question is not so much will you have dessert but what are you going to choose for dessert? The dessert tray is incredible as the desserts are homemade daily with recipes direct from Brazil, passed down from generation to generation in the family of the founder, Ivan Utera. Your taste buds will be doing the Samba as you literally taste the sweet side of Brazil. For the chocolate lovers, Torta Brigadeiro is a luxurious indulgence that features a slice of decadent chocolate mousse torte, made with a blend of four types of chocolate, served à la mode with sliced bananas and fresh whipped crème. Pudim De Leite – the most incredible flan you’ve ever tasted, or the sinfully tempting Romeu E Julieta Style Cheesecake with luscious Brazilian Guava Sauce are several other delicious options. Brazil’s exotic fruit juice is unmatched. Let’s be real orange juice is pretty basic but have you ventured out to try mango, passion fruit, guava, or coconut juice? Rodizio Grill offers a full bar including specialty Brazilian exotic drinks such as Passion Fruit Martini, and the Caipirinha (a Brazilian tradition and Rodizio’s signature drink). The traditional soft drink in Brazil is made from Guarana berries grown in the Amazon region. The guarana berry is known to be a natural source of caffeine and energy and the sweetness of its flavor is actually quite addicting. The sodas made from guarana berries are heaven in a can. There is no US equivalent. Try one while dining out. Ask for Guarana Antarctica. Rodizio Grill offers the perfect setting for your next event. Holiday parties, wedding receptions, corporate luncheons and dinner, seminars and more. Patio seating, large party rooms and business meeting rooms available. Reserve your special event today. Open every day for Dinner at 5 pm and open Friday, Saturday, and Sunday for Brunch 11am-3pm.